Lil' Bits "Coffee Talk" is like being in a restaurant where they brew it for you! Our Lil Bits digital element pack gives you many premade elements and word sayings to simply pop onto your cards and layouts without you having to build or "brew" them yourself. How easy is that?? Just enjoy! 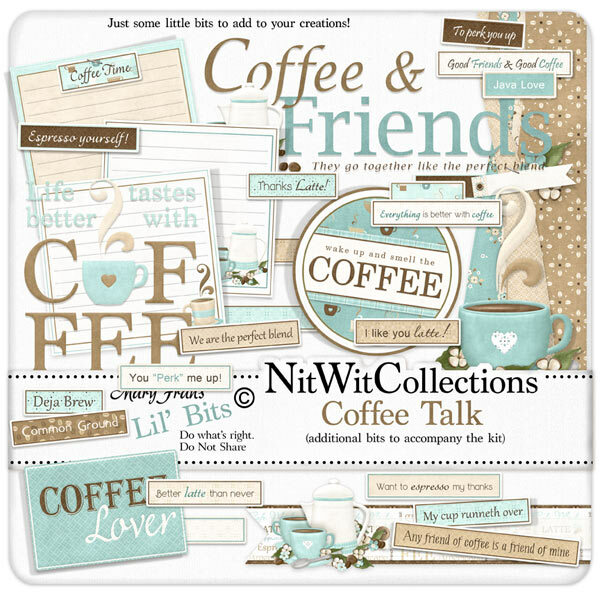 These digital elements are NOT included in the FQB "Coffee Talk" Collection so don't pass these by! 1 Corner strip - can you see this on your layout or card?? 3 Journal labels complete with lines and design.....what do you want to say or remember? 1 Label - "Coffee Lover"
1 Label - "Wake up and Smell the Coffee"
1 Wordart - "Coffee & Friends....."
5 Wordstrips - blank for you to write on...what do you want to say? ?